The plantations currently support the production of 2 essential oil, mulch and beef cattle. Melaleuca alternifolia is an evergreen paper bark tree indigenous to the northern coastal region of New South Wales, Australia. It grows to a height of 6m with a spread of 4m and has white flowers appearing from spring into the early parts of summer. The leaves are alternate, lancelet, acuminate, and are 1.5cm long. 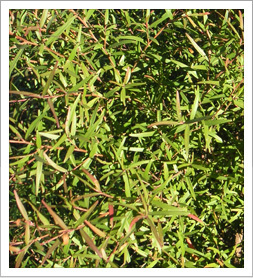 Leptospermum petersonii is an evergreen shrub native to Southern Queensland and Northern New South Wales, Australia. It grows to a height of 4m with a spread of 2m and has a graceful stem with slender branches and a lightly textured crown. The leaves are about 3.5cm long, broad, flat and light green in colour with an aromatic lemon scent. 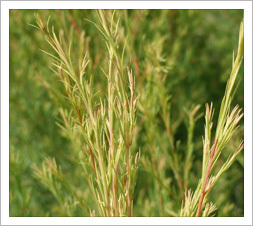 Tea Tree Mulch is a by-product of the harvest and distillation process. It is increasingly in demand and competitively priced for general composting & gardening, landscaping, nurseries and crop production. As part of our commitment to sustainable agriculture and minimising its machinery inputs and processes, we have invested heavily into cattle grazing.